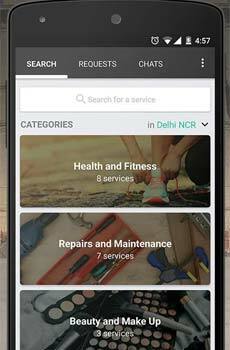 Delhi-based UrbanClap Technologies India Pvt Ltd, which runs a mobile-only marketplace to find local service professionals under the UrbanClap brand, has raised $25 million (Rs 165 crore) in its Series B round of funding led by Bessemer Venture Partners, it said on Thursday. Existing investors Accel Partners and SAIF Partners also participated in the round. With this, it has now raised almost $37 million since April this year. It first raised Rs 10 crore ($1.6 million) in seed funding from SAIF Partners, Accel Partners and Snapdeal co-founders Kunal Bahl and Rohit Bansal. Two months later, it raised$10 million in its Series A round of funding from SAIF and Accel. Abhiraj Bhal, co-founder of UrbanClap, said the firm is serving 5,000 customer requests a day, and has built a base of more than 20,000 service professionals. He claimed that UrbanClap is now sending them business worth $200 annually (current run rate)—which means it is processing requests for gross transaction value worth Rs 110 crore a month—from small carpentry jobs worth Rs 200, to large interior designing assignments worth several lakhs. "This is a winner-takes-all market "there is no place for second best. With this round of funding, we are positioned to build a large company that Indians love and makes their everyday lives easier," he added. The firm plans to use the funds to strengthen its business and expand across all major cities in India. By the same time next year, it is aiming to have over 100,000 professionals on the platform and serve over 100,000 customers a day. Headquartered in Gurgaon, UrbanClap offers services in more than 75 categories across Delhi NCR, Bengaluru, Mumbai, Chennai and Pune. The company plans to extend its offering to 25 cities and more than 100 categories over the next one year. Further, the funds will be used to make strategic acquisitions and increase its team size from 300 to around 600, it said. Vishal Gupta, managing director of Bessemer Venture Partners, said, "They are building a service India needs. Further, they are amongst the most frugal and capital efficient companies we have met, with a strong long-term focus." The local services marketplace has become a hot vertical with a bunch of startups getting funding in quick succession. On-demand home services platform Zimmber had secured $400,000 (Rs 2.5 crore) in a fresh round of funding in July from top officials at mobile ad network InMobi. But some early signs of consolidation are also visible with Mumbai-based Imma Web Pvt Ltd, which runs LocalOye, a mobile-only marketplace for local household and personal service providers, laying off 60 of its 100-member call servicing unit staff as part of a restructuring plan. All these firms compete with local services search engine Just Dial. Just Dial, which was essentially a local search directory, has also now added transaction-related services in its revamped app that allows consumers to book appointments and even pay online for services against its previous avatar where it served as a directory for finding contact details of such service providers.